Powers™, a WATTS Brand, has been innovating and developing commercial and industrial instrumentation—including automatic control valves, self-operating temperature regulating valves, and process monitors—for over 100 years. They provide a variety of reliable, easy to use, rugged instrumentation for engineers who require control, backup control, and operator interface solutions for their applications. 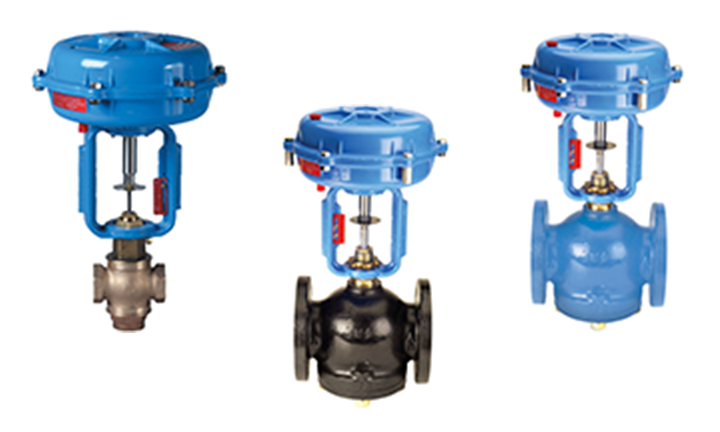 Mountain Controls offers the following Powers Flowrite II control valves. For more information about each of the valves, see the corresponding Datasheets linked in the tables below and contact us to start your order. Accritem controllers are used to maintain temperature in a variety of applications, including water heaters, compressors, coolers, heat exchangers, and more. The controllers are offered with either rigid or remote bulb sensing elements, which are mounted directly in the medium to be controlled. 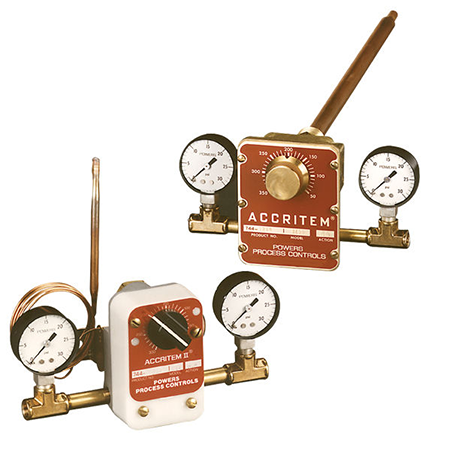 When a temperature change occurs, Accritem responds with a pneumatic signal sent to a control valve. Rigid bulb controllers include pressure gauges and a 1/2" NPT pipe fitting. The sensing element is available in either copper or stainless steel. Remote bulb controllers enable increased flexibility with remote monitoring of temperatures. They are offered in either copper or stainless steel and include a 3/8" NPT brass compression fitting to allow direct mounting of the bulb in a pipe or tank in a variety of positions. For more information about these controllers, see the Accritem Controllers Rigid and Remote Bulb Blind Controllers Datasheet launch and contact us to start your order. Powers offers numerous remote bulb options to provide flexibility to fit your applications. Powers #11 regulators negate the need for external power to control the process of the heating or cooling medium while maintaining a consistent temperature. They are applicable to a wide range of uses including processing equipment, heat exchangers, and machinery. Powers provides flexiblity and economy with its #11 Regulator line of interchangeable sensing and control components. The line offers a selection of 29 thermal systems (remote bulb, capillary, and bellows) and up to 35 standard valve assemblies to meet a variety of specialty process needs. 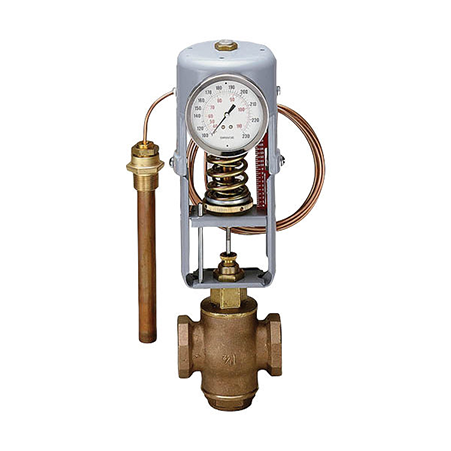 With these regulators, you can quickly replace the valve assembly in your supply line as your needs change or if a thermal system becomes damaged. In addition to the wide range of options available in the above component thermal system regulators, Powers Process Controls also offers the ability to customize #11 Regulators for specialty applications. For more information about all of the options available with these regulators, see the #11 Self-Operating Temperature Regulators Datasheet launch and contact us to start your order.